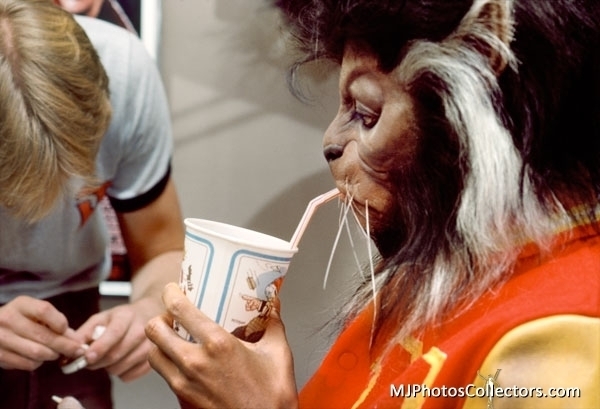 The Making Of Scary Pop: Michael Jackson's "Thriller"
...because this image chills me to this very day. Michael Jackson's "Thriller", that about fourteen minute music video with the pop icon in red leather get-up, a werewolf, zombies, and a frightened young woman who looked eerily like one of my mother's closest friends at the time all managed to successfully scare the hell out of me. After watching it for the first time not too long after its release, I immediately became cautious before turning every dark corner and made sure my nightlight bulb was fresh. I even imagined I could watch it during the day time and the imagery would lose its effect. So I did. That was a joke. Although terrified, I was transfixed. A mild obsession with absorbing fear and being bold enough to make attempts at exorcising it, everything about "Thriller" was an absolute feast. Looking back, I couldn't fully comprehend the mastery behind every dance move, musical composition, direction, makeup effects or even the reasonable chemistry between Michael and Ola Ray, but I knew it was pure earthly perfection. And as I dared to look again in the daylight, still ready for my bowels to drop at any unsourced sound, at that moment back in nineteen-eighty-something, I had a feeling horror would become a part of my life from there on. During this time, Michael was naturally establishing himself as arguably, the biggest entertainer ever. His Motown 25 performance was a repeat guest on the living room television screen when my mom's friends stopped by to see the VHS-dubbed copy, or just when the babysitter wasn't busy wearing out our copy of Krush Groove. I loved Michael because he was a chameleon. He consistently used his platform to make music an experience that would burn in your memory infinitely. The song lyrics by Rodney Lynn 'Rod' Tempterton (whose songwriting credits range widely from Karen Carpenter to Aretha Franklin) chose the title "Thriller" over "Starlight" after some input by producer Quincy Jones. Jones was key to building what "Thriller" would ultimately become audibly. He demanded the very best from everyone working on it. 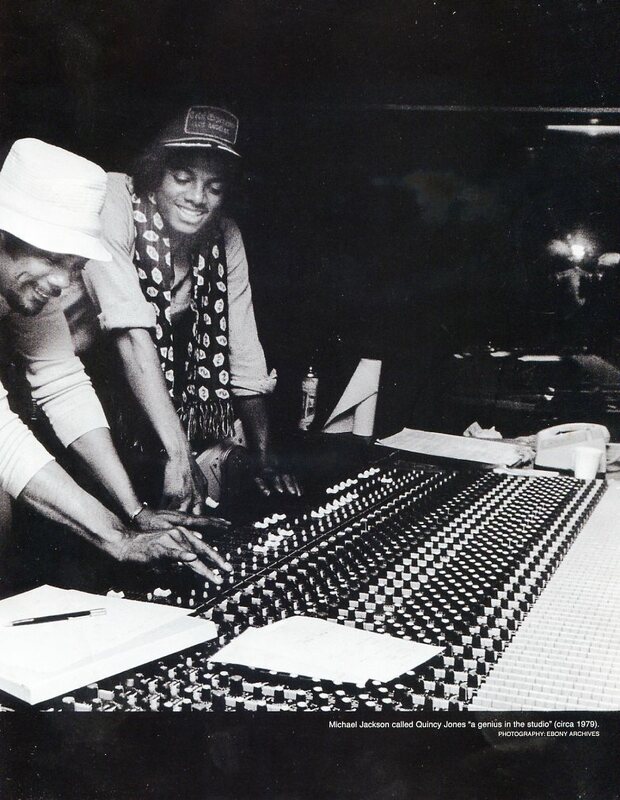 His statement in Westlake Recording Studios back in 1982: "OK guys, we're here to save the music industry." Further, one of his now ex-wives, Peggy Lipton knew and suggested Vincent Price, whom by her request, agreed to lay down the now famous dark spoken word that accentuated the atmosphere of the track. Some of Jackson's own vocals were layered by applying takes where his voice carried away from the microphone, an effect executed in a shower stall. 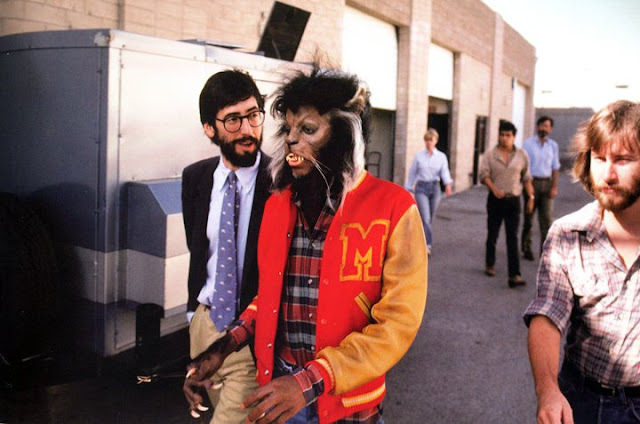 With an open mind and desire to see his art stretched in many forms, Michael secured the talents of director John Landis and creature creator legend Rick Baker. Michael had seen Landis and Baker's collaborative effort, An American Werewolf in London (1981) and wanted to simply, "become a monster". The approach to "Thriller" from the creator's standpoint wasn't extremely profound. It was a video created to entertain and show off in the most humbling of ways. Every element has been seen in film before. The uniqueness arguably is from the collaboration of the decision makers. 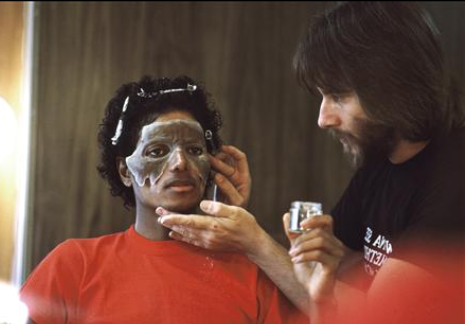 Michael was intricate to the creative process and ultimately what you see was his vision, right down to the way he and choreographer Michael Peters imagined how zombies would move and contort their faces. Michael talked fondly about working with Baker during this time, calling his professional studio "a museum of horror" with awe. He was clearly in good hands; Baker has been crafting characters and frightening neighborhood parents before he even made it to junior high school. His very long list of effects work in the entertainment industry dates back to Larry Cohen's 1972 comedy Bone. Baker is also a model for time management, juggling MJ's multiple transformations and 30 varying, zombie makeups with no idea who the dancers/makeup models were. One strategy was to utilize his team as the stand-in zombies who didn't have to dance (the zombies you see rising from graves, sewers, etc). There were 20 other makeup artists assisting with applications and painting. When it came to the werewolf look, Baker wanted to play around with a character that was much more "feline" in form but with some finishing touches to the hair appliances and other attributes, read very clearly as a wolf. On December 2, 1983, "Thriller" premiered on MTV, making the network "a new cultural force" by dissolving its highly critiqued discriminatory music rotation. "Thriller" was instrumental in propelling "The Making Of..." programming, VHS sales, and video rentals into a viable revenue-generating market for an ever growing mediated society. Essentially, the music video transformed the music video itself into big business. 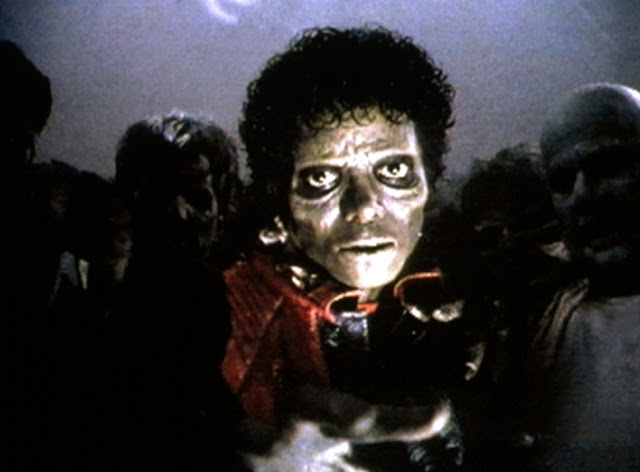 Aside from its industry dent, "Thriller" has been a longstanding pop culture epidemic. The "zombie dance" itself has been taken on by millions, and as many of 13,597 at one time in one place in Mexico City in August 2009. All the way down to a dozen of my high school peers in a Halloween competition back in 1996. Whatever the case for interpreting quite a audio/visual convergence, "Thriller" went on to inspire college courses, dozens of YouTube, pop culture parodies and give millions an entertaining "boo". Coming full circle, it's an essential declaration I hold with my own bit of fragility and simultaneously, strength. This painful process of transformation, becoming something terrifying powerful is such a beautifully open-ended metaphor that I feel it speaks to the human condition navigating life itself. "Thriller" is a relic that'll always remind me of my horror roots.